A couple of weekends ago, I made a trip down to our local Farmer’s Market in San Antonio at the Pearl Brewery. I have been wanting to to go for months to pick up some fresh eggs, but something always seems to get in the way – usually the kiddo’s sports games:-). I finally had the opportunity at the end of June, and I was not disappointed. I grabbed my two youngest, yanking them away from their iPad screens almost kicking and screaming, strapped them into the car, and off we went! I have to admit, he wasn’t too far off. It was much larger than I remembered from a few years ago. It is very nicely set up, and there were many foods and vendors from which to choose along with music, an information booth, and LOTS of dogs! I highly recommend going (EARLY) if you have the chance. I say early because when we arrived around 9:30 there were many options and plenty of stock. By the time we left at noon, after seeing everything, I was scraping at the remnants of what was left. I saw there was plenty when we arrived so I didn’t see the need to purchase anything right in the beginning just to carry it around with us. My recommendation would be to take a cooler, buy as you go, and then stash your items in the car so you can keep shopping and grazing. And grazing you can go! My children tasted everything there you could possibly taste! Look at these happy kiddos! These do not look like the same children I tortured by pulling them away from their electronics! These are my happy children. Of course, what is not to like after you have just tasted fresh Greek yogurt from grass-fed cows. There was no more kicking and screaming. 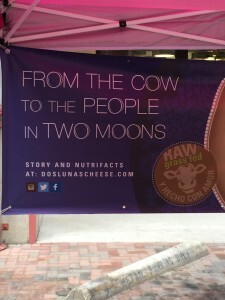 After a bite of yogurt and some tasty cheese, they asked me if they could come back every weekend. Like I said, I went for eggs, and there were many suppliers for eggs. The supplier that I liked the most after talking about the hens only had 2 dozen left at noon so I cleaned him out. Next time, that will be my first stop! While I was in the Wholesome Harvest Farms booth getting my eggs, I picked up some delicious yellow squash as well, to make my yummy squash casserole! The kids favorite booths were the ones with the yogurt and the many artisan cheeses. They were delicious. 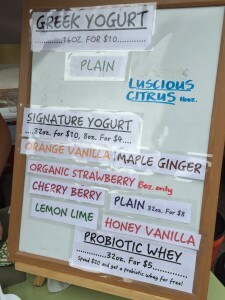 All were made with milk from grass-fed cows. You can’t go wrong with those nutrients. Even though I don’t eat yogurt, I certainly let my children eat this fresh one made with all fresh ingredients. Right next door was the cheese lady. Her products were amazing, and the milk was from a farm in Schulenburg, Texas. Supposedly the best milk in the Lone Star State coming from Jersey Cows that graze the green grass of our great state! We bought two of the four flavors and they are devine. My favorite is the black pepper, but the other one was a cumin flavor that was also out of this world! We hopped across to the goat milk people and purchased some jalapeño and artichoke cheese made from goat’s milk that is just incredible! So fresh and smooth. I spread it on some parmesan crisps for a crunchy snack. Moving on, we made it around to the mushroom farmers! This may be the best yet, but oh how hard to judge. I bought some portobellos and white mushrooms, all of which I used for stuffing! Amazing! Then on to the meat…Pork and Beef. 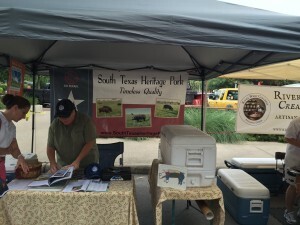 There were two pork ranchers, both of which were organic and grass-fed. 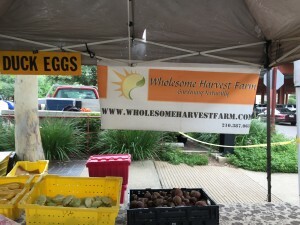 The one lady I spoke with seemed to know all about the different farmers and ranchers at the farmer’s market so she gave me some tips, and I purchased from her. I ended up going with some pork belly. I had never cooked the pork belly before, but have loved it as a delicacy in restaurants. It fulfills our fat intake necessity, and actually turned out pretty yummy. It is almost impossible to find except directly from those who raise pigs so this was the place to find it. Then, on to beef! I found three vendors, and referred to my nice new friend at the pork booth. She recommended one cattle ranch that has been owned by the same family for generations. The meat was fantastic. It was pricey, but worth it! I purchased some steaks and some ground beef that were all devoured. We also did buy some beef sticks and dried sausage from one other cattle rancher that the boys ate in no time for a quick snack. Those beef sticks are one of their very favorite snacks! When it was time to go, we still had lots of smiles, and a request to return every weekend! If not for all the samples, just to watch the puppies tour around the market. There were many. This was a great outing not only for healthy food, but for family togetherness – away from those mesmerizing flat screens. 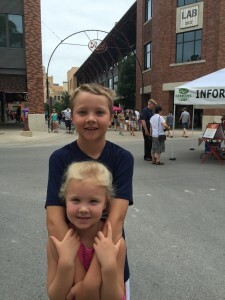 I actually got to see my children enjoy each other, nature, great food, and a little culture all mixed in together. 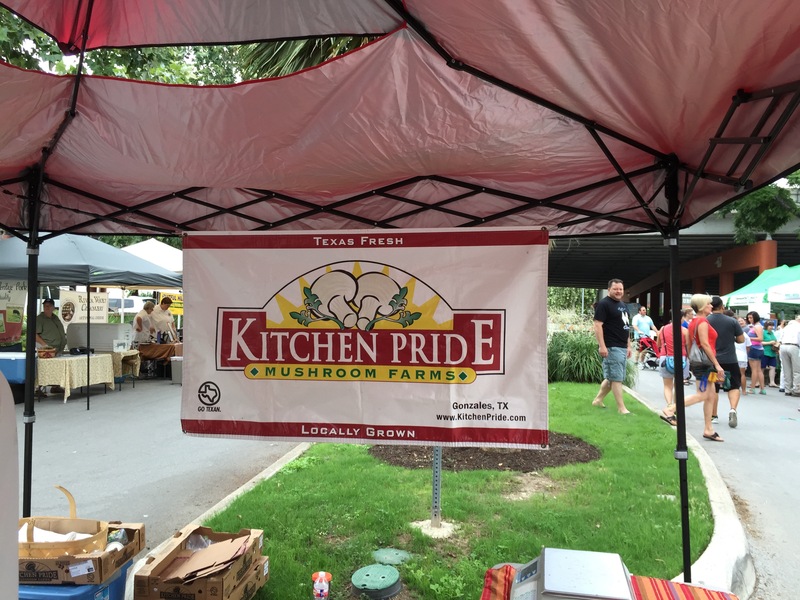 If you have a chance, try to get out to your local market on a weekend. It is quite an experience and a great haul at the same time! Preparing for the Road Trip! Yesterday, Erin posted about air travel, and relatives or friends preparing for your visit. 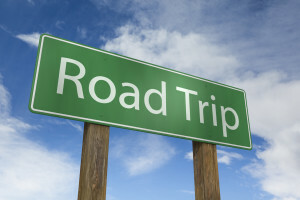 Summer also means road trips, and we do quite a few! The Lutz clan just returned from the Texas coast. I knew after a busy school year, that I wanted it to be a relaxing time for the family. As much as I love to cook, I didn’t want to be running upstairs, while the rest of the family played in the pool, just to start dinner. I also know that my kitchen at home is much more stocked than any vacation home on the planet – and I am not one that likes to be without my kitchen tools. It is just so much faster and more efficient to have the right tools! You can find many of the tools we use in our store. The best thing to do is prepare in advance!!! 1. Spiraled some zucchini for noodles, and packed in a airtight container. Spaghetti is a super easy meal to throw together in a pinch. 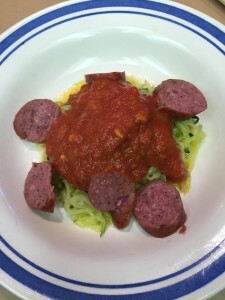 I took some precooked sausage that I boiled to throw on top with my favorite low-carb pasta sauce. Normally, I would top with shredded mozzarella or parmesan, but I forgot the shredded cheese. We did have string cheese, so for those that wanted cheese atop their spaghetti, I just pulled some strings off the string cheese. Along with a salad, topped with avocado, we had a meal in a flash. 2. I used my Cuisinart to make Cauliflower rice in about 2 minutes. 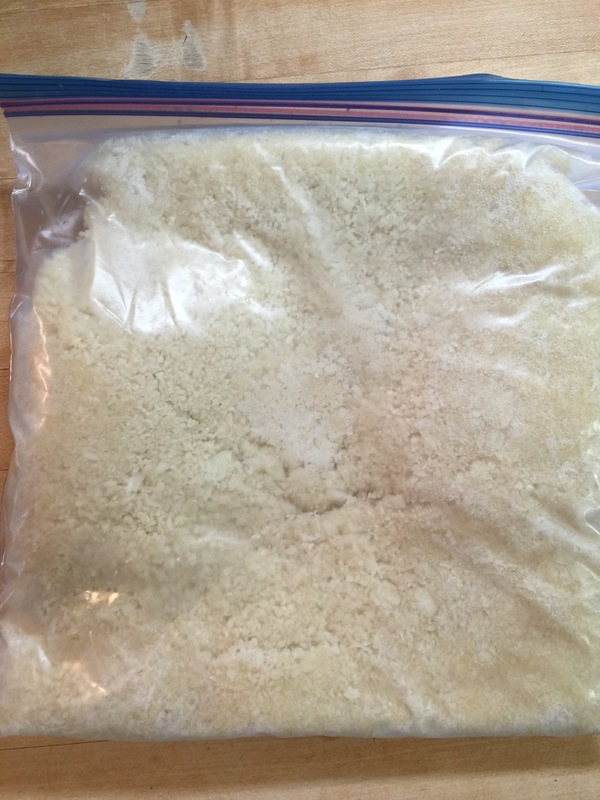 I put it in a Ziplock bag as flat as possible for easy packing, and freeze. This freezes so well, and then all you have to do is defrost, throw on a cookie sheet for about 25 minutes and you have rice ready to go. Serve with fish (you catch) or I used a chicken curry and broccolini that I had in the fridge. Another well-balanced meal! 3. Pack those frozen casseroles you have made when you have extra ingredients. 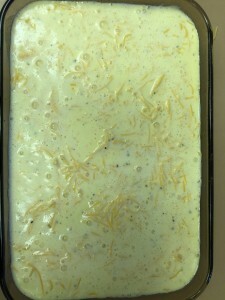 I had a frozen zucchini lasagna made from extra ingredients when I made one recently for dinner. Defrost, throw in the oven, and dinner is ready in 40 minutes – no cooking or dirty dishes! 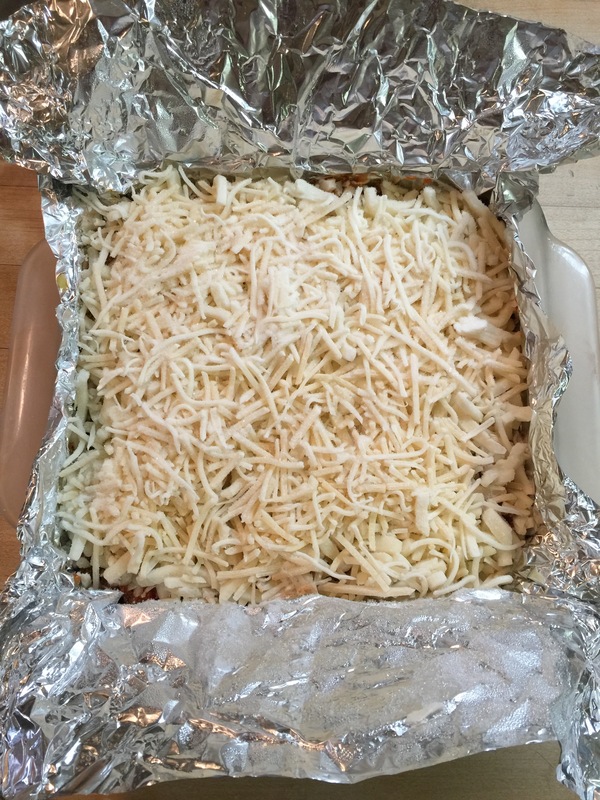 One trick I use for freezing is to line an 8×8 pyrex with heavy duty foil before I start layering lasagna or any other casserole. I wrap it up and freeze in the dish. Once frozen, I lift the whole thing out of the Pyrex and wrap in Saran very well. Now you have a brick of food that is easy to pack in the ice chest and don’t risk leaving your dish away from home. 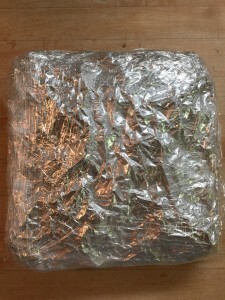 When you are ready to cook it, remove the plastic wrap and defrost in an 8×8 dish. Almost any condo or vacation home has an 8×8 pyrex or metal pan I have noticed. 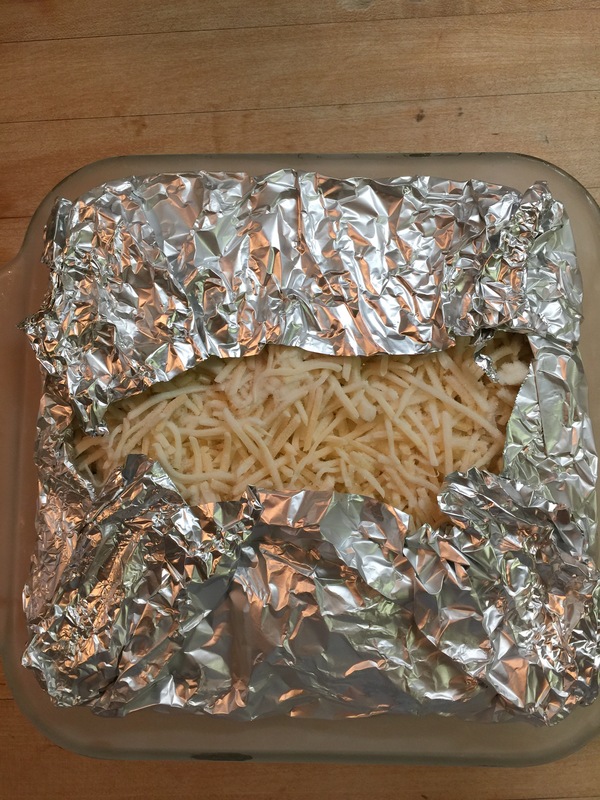 You can cook it in the foil in which it was wrapped. Check out this link at Southern Living for step by step freezing directions. 4. Another easy meal is precooked Bar-B-Que. I bought a precooked whole brisket which gave us dinner, a few lunches and dinner ready to microwave when we returned home. 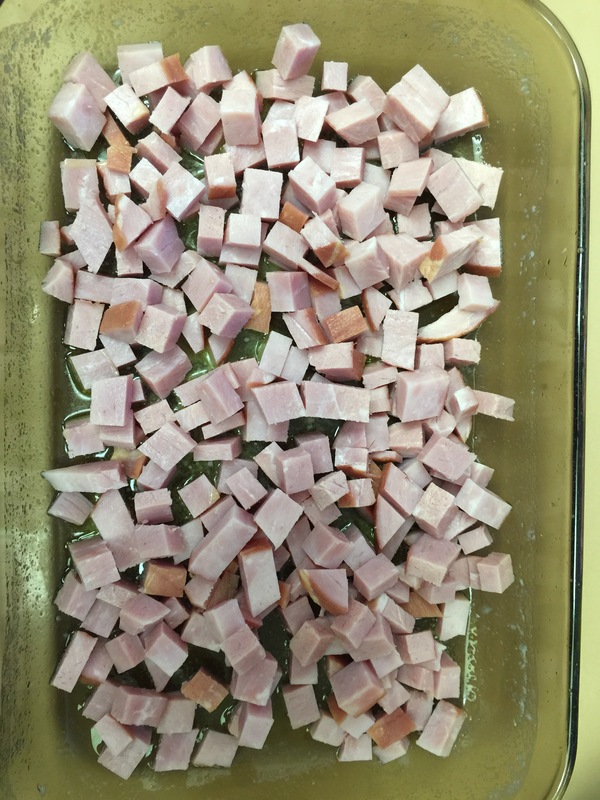 My trick for this is easy – save your bacon grease from breakfast when you cook on a foil lined cookie sheet. Yes! You can leave it out all day – I promise it will be fine! I plop that slab of meat in the grease, wrap it in extra foil, and you will have the juiciest pre-cooked meat you can imagine. I shredded cabbage before I left home and cooked it with bacon, onion and garlic. Store in an airtight container, and this re-heats better than any other veggie and is so good for you. We will be sharing this recipe soon! It is an excellent accompaniment to Bar-B-Que. 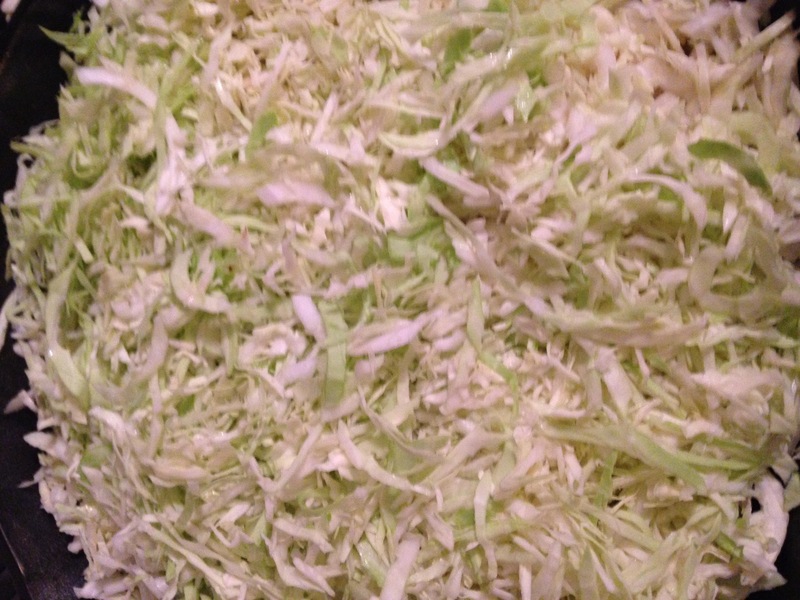 This is the shredded cabbage before I cooked it! 5. 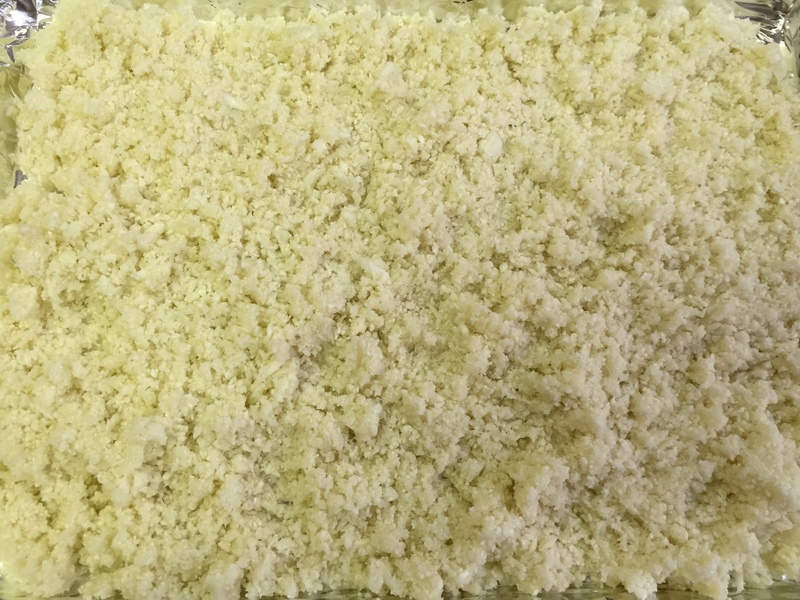 I made another casserole that I had in the freezer that was similar to Chicken Divan like most of our mothers used to make. It’s the one with chicken, broccoli and cheese in a creamy curry sauce. The original recipe is almost Keto, but I change out the canned soups for more mayo, lemon, broth, and cream. Top with lots of cheese and you have a winner, winner, chicken dinner. I always serve with a side salad. Add the avocado my friends! 6. Generally we have scrambled or poached (yes, I take my poacher) eggs and bacon for breakfast. Check out our amazon store to see my poacher. Sometimes I mix in chorizo with the scrambled eggs to change it up. 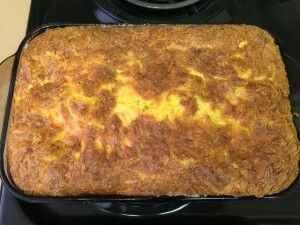 Last time I made a quiche at home, my kids requested ham and cheese, so I decided to do this ahead since the boys were playing golf early the next morning. It made for a quick breakfast with no clean up. 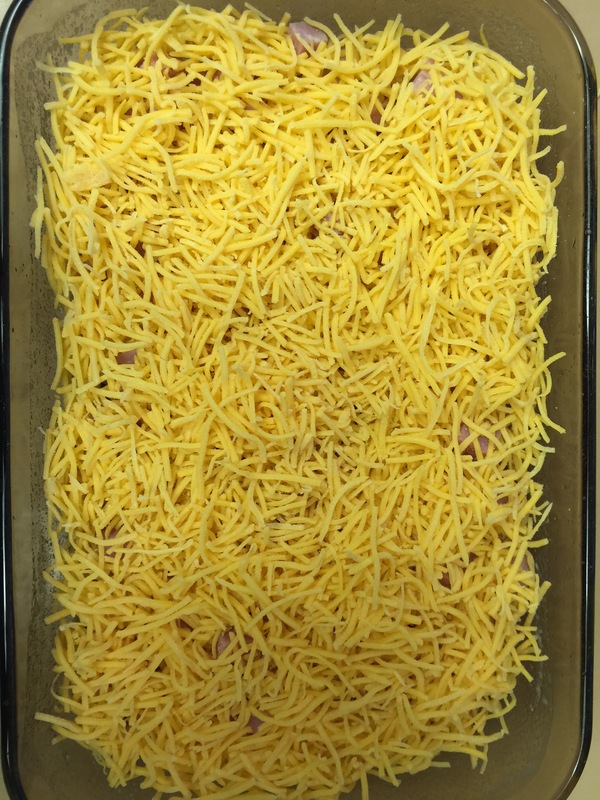 I sprayed a casserole dish with Coconut Oil spray, cubed some ham, topped with cheddar cheese, and mixed 8 eggs with 1 1/2 cups of cream and garlic salt and pepper (go light on the salt for once on this one because the ham and cheese are already salty.) 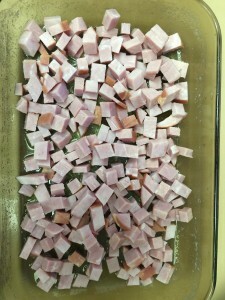 Poor the egg mixture over the ham and cheese and store in the fridge overnight topped with saran. In the morning when everyone is rising, remove the saran and pop it in the oven at 350 degrees for about an hour. This gave us two easy morning meals that were very filling, and the kids gobbled it up! 7. We had tons of left-overs at this point, so we served buffet style one night, and also at lunch if we weren’t making lettuce wraps for the beach. 8. We always eat out one night for some fresh fish. 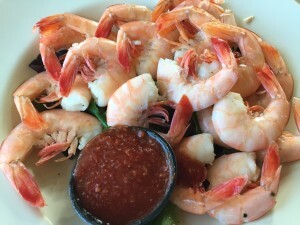 It just happened to be Snapper season, so my husband and I both started with peel ’em and eat ’em shrimp, and ordered the Snapper Special at Seafood and Spaghetti Works that was fantastic. 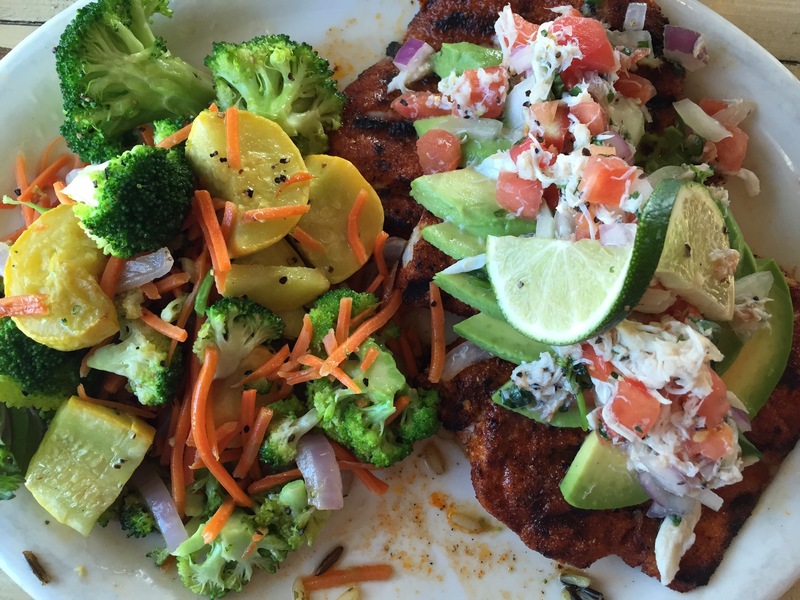 It was blackened in butter and topped with sliced avocado and a crabmeat pico de gallo. 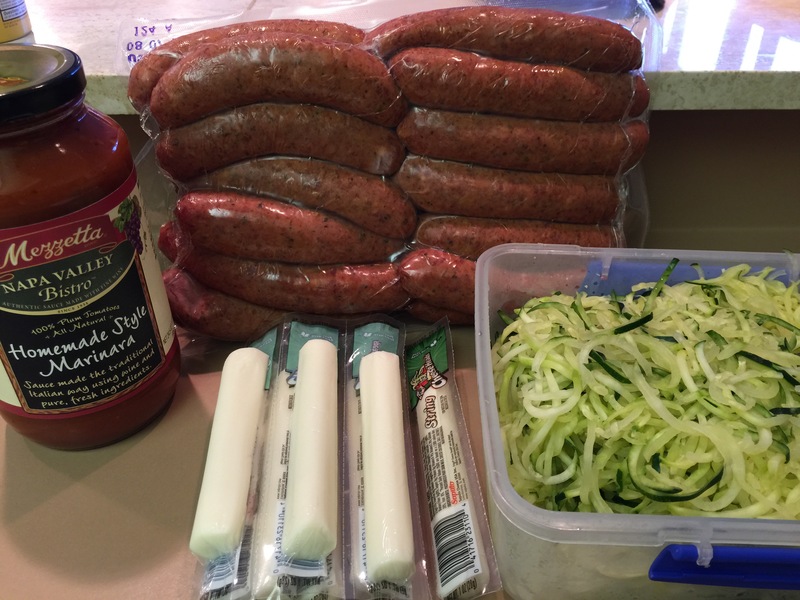 It was amazing, and it could not have been more Keto. Once you learn to eat Keto, it really becomes easy to eat out. See our tips in our eating out post. Isn’t that beautiful? REAL food is just awesome! These are the foods that were designed to fuel our human bodies. As you can see, I really did no cooking at all for seven nights. It was all reheating, and I had a healthy dinner ready every night with less than 20 minutes of prep time. I literally prepped dinner and set the table while the children were bathing each night! We all hope everyone has a safe, fun, relaxing summer filled with memory making vacations! 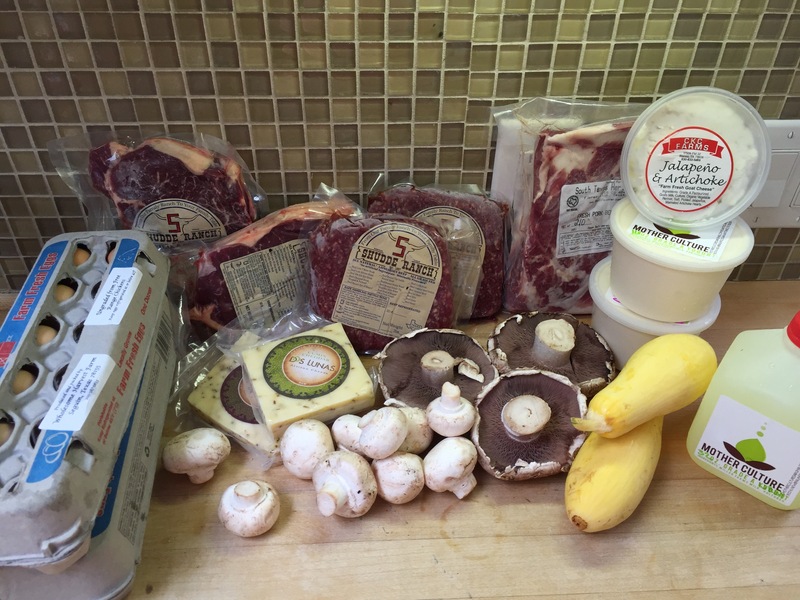 Let’s face it…being on a Ketogenic diet with REAL food is not inexpensive! We are trying to be as healthy as possible, which comes at an expense to our wallets. In fact, today, while listening to a Livin’ La Vida podcast, a nutrition expert and author was discussing the fact that higher income countries are actually consuming less grains now than low net income countries because those packaged foods and grains cost pennies compared to “real food” which is actually nourishing. Very sad! I totally believe it is worth every penny to feed my family well, but at the same time, I try to save where I can! This is where buying in bulk can help, especially when feeding a hungry family of five. I have two growing boys that eat constantly. Now, I do have to say, a high fat, real food diet, keeps you full much longer that the recommended, low fat Standard American Diet (SAD), so in terms of food, you are not eating the same quantity. There are certain foods that we consume more often than others, so using a store like Costco or Sam’s can help you. One of the more frequent questions we receive is where we buy our groceries. The answer is…everywhere, but I don’t shop at every store every week. I probably make a Costco run every two weeks, so I thought I would share the basics I keep on hand in bulk. 1. Almond Flour: I have said this before, but do not even try the other brands…Honeyville is far superior to any of the others. I have tried all of them, and hands down, Honeyville bakes the best with the least amount of heavy texture. Costco saves you a ton…you can’t find a lower price even on Honeyville’s own website! 2. 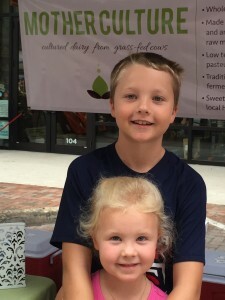 Berries: (On both sides – All organic!) While we do not recommend a large amount of fruit on a Keto diet, berries are by far the best choice. They are the lowest in fructose and have a high amount of anti-oxidants. These are primarily for the children, but every once in a while, I will have a small handful in a bowl of sugar-free whipped cream (homemade) with Swerve and vanilla for a sweet treat. Remember to always eat protein and carbs with lots of fat so you stay a fat burner! 3. Avocados: Costco usually has bags of five or six avocados. I use these for lunch filled with shrimp salad or plain with salt and lime or on salads. We ALWAYS have guacamole in the house. We use it on eggs in the morning and meat in the evenings. You can never have too many avocados. 4. 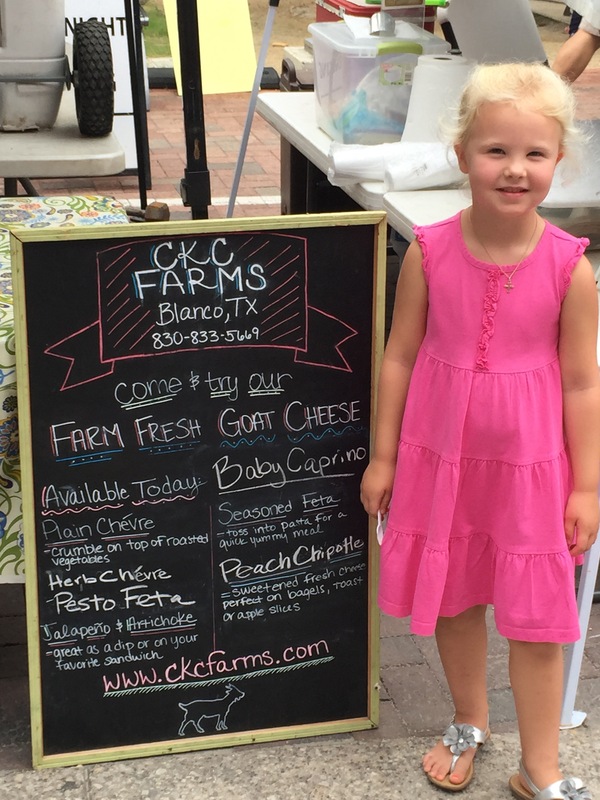 Cheese: One of the biggest differences between the Ketogenic diet and the Paleo diet is the allowance of dairy. We love cheese! 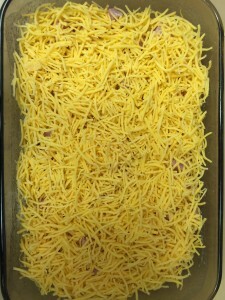 I bought the blocks of cheese because many of the shredded cheeses use potato starch to keep the cheese from clumping. 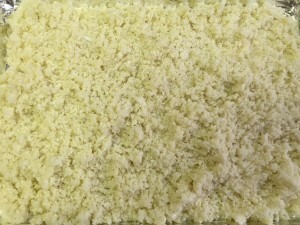 I use my food processor attachment to shred the cheese for large quantities. I DO cheat, and buy shredded cheese on occasion to keep in the fridge for morning eggs and a quick grab, but the blocks are better as well as cheese sticks. All are a great buy at Costco or Sam’s. 5. 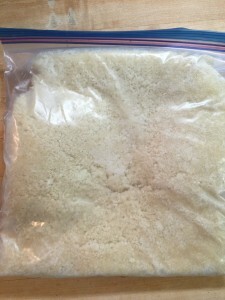 Organic Ground Meat: I keep these in the freezer for an easy throw together dinner. You know we prefer the Grass-fed beef, but in a pinch these are great to have stored. 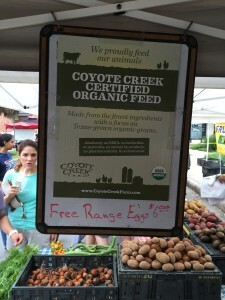 While not as great as Grass-fed, it is a better alternative than your antibiotic and hormone ridden meats. 6. Kerrygold Butter: Need I say more? I think you all know how we feel about Kerrygold. 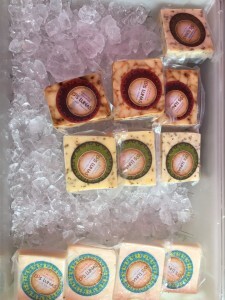 It is delicious Grass-fed butter from Irish cows! It comes in packs of 3 at Costco, so I always pick up a couple when I am there! 7. 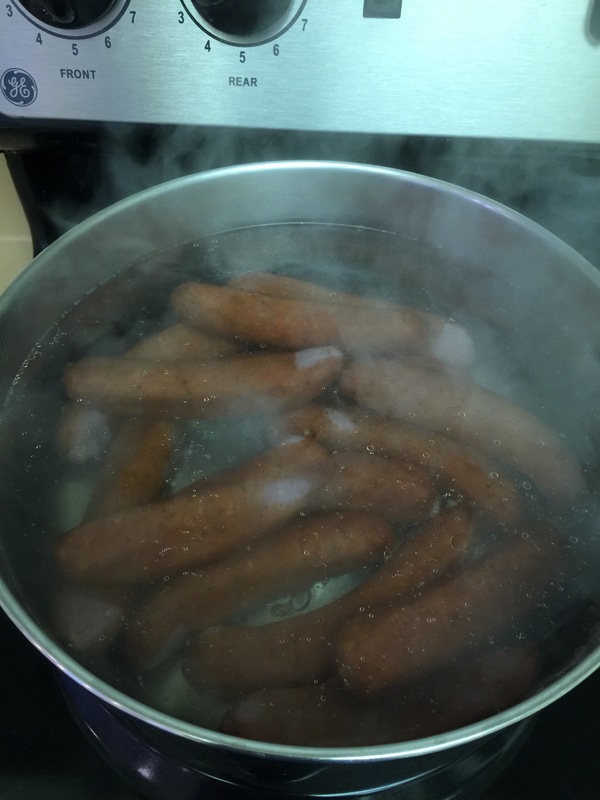 Sausage: My kiddos love sausage. My husband grills it, and we serve it over zucchini noodles or eat it plain. Kiolbassa is also made in San Antonio so you are supporting a local business if you live here! 8. Daisy Sour Cream: I always have sour cream and cream cheese (I buy cream cheese at Sam’s) on hand for sides to add more fat. Remember, you want full fat. The low fat and fat free versions are NOT REAL FOOD! They are filled with chemicals and additives. Stick with the good ingredients our great-grandparents used, and their ancestors before them! 9. 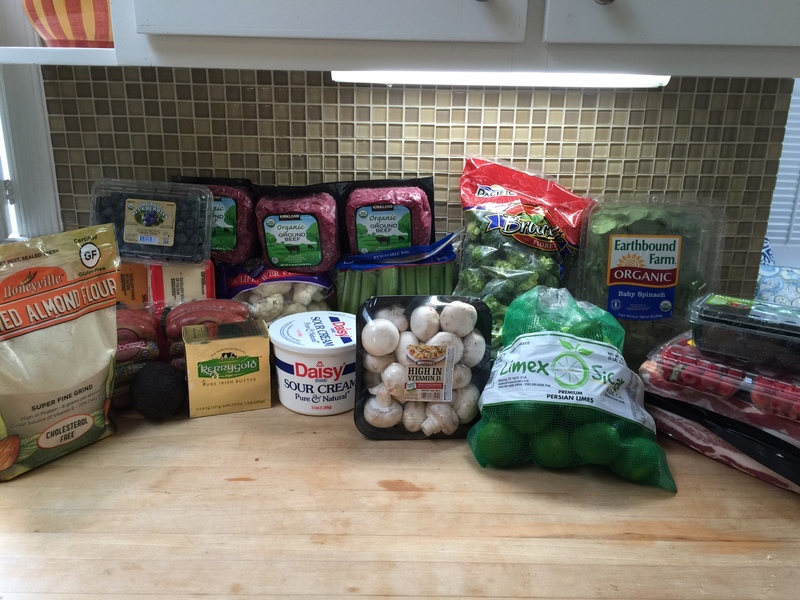 Veggies: We LOVE veggies…We are fortunate that Costco has many organic vegetable options. Not all of them are organic, however, so please wash well! A friend was over recently, and I was washing fruit with soap and water when she questioned me about it. Water alone will not wash off the chemicals. You really need to wash in a fruit and veggie wash or use a soap. I make a bath of soapy water and soak them in the wash and then rinse in a colander with cold water. This still does not guarantee the removal of all chemicals, but it is a better bet. I love the cauliflower, spinach, and mushrooms at Costco. These are always on my list. I also stock up on limes in the summer to make infused water and iced tea. I must admit, that I also like a cocktail on the weekends made with a lot of fresh lime juice mixed with vodka and soda, or dare I say, tequila, for a homemade sugar-free margarita! One drink usually takes 4 to 5 limes (or more) so that explains the bulk on these. 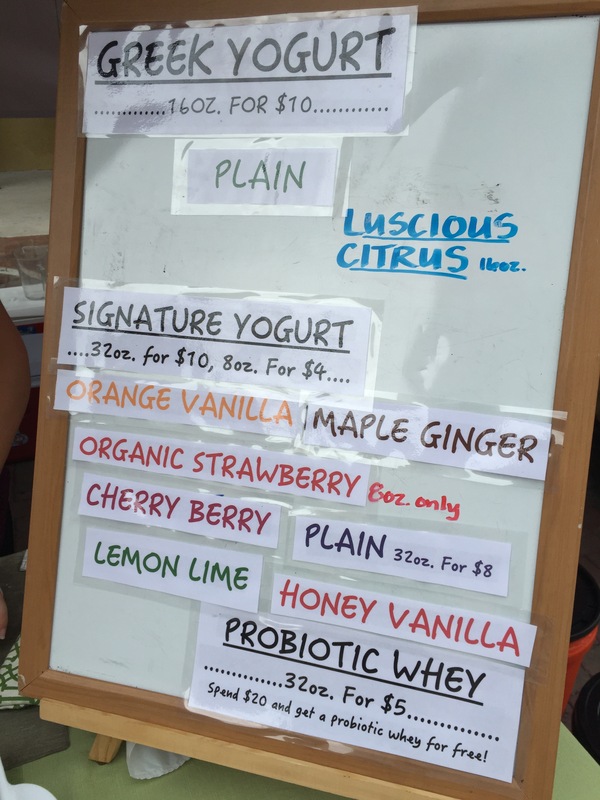 Broccoli and celery were also on the list this week. Please make sure you wash your celery VERY well. It can be a really dirty one! 10. BACON: Who can have too much bacon? Always on the list. Try to buy bacon as naturally as possible without a lot of curing ingredients. Each Costco carries different bacon I’ve noticed, so look at your labels. 11. Coconut Oil: It is not in the picture, but another staple that we all buy at Costco is Coconut Oil. This makes great Bulletproof Coffee for all of us each morning! A definite staple, and a much better buy at Costco or Sam’s. Any questions or comments? Leave us feedback. We would love to hear what Low-Carb High-Fat foods you like to buy at Costco or Sam’s! Monday is usually my HEB run for standard groceries. I thought I would share what I bought for the next few days, and explain how I am going to use everything! 1. 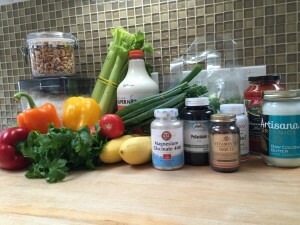 Apple Cider Vinegar – I ran out yesterday experimenting with my Keto Bar-B-Que sauce I hope to share soon. It is always in the pantry! 2. Coconut Oil Spray – I noticed today there are two different versions on the shelf. The new one I purchased today is for high-heat cooking which is mainly what it is used for, so I am going to give it a try! 3. Broccolini and Kerry Gold- This is one of our favorite veggies to have on the side! Pile on some of the Kerry Gold to make it even better! 4. Grass Fed Ground Meat – I plan to make cheese stuffed “Spaghetti” and Meatballs! Yum! 5. Heavy Whipping Cream – Always in the house for coffee, tea, eggs, sauces, and whipped cream mixed with Swerve! Double yum! 6. 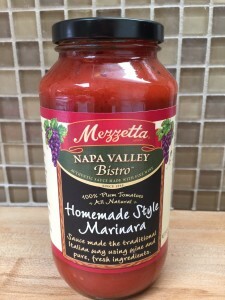 Organic tomato sauce – Also used up yesterday for my Bar-B-Que sauce. I keep it stocked in the pantry. 7. Coconut Milk – Used for a yummy curry Indian dish this week – make sure you buy the full fat! 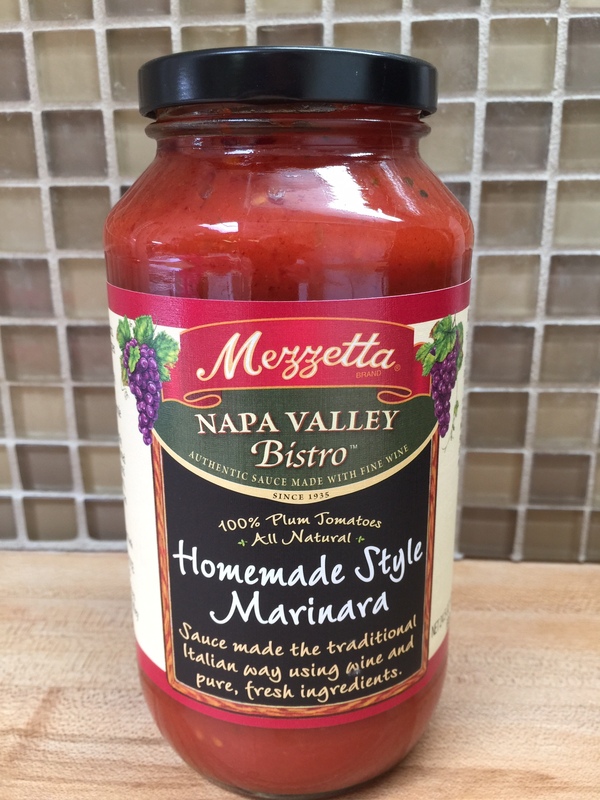 Another pantry staple! 8. Cauliflower – I am ricing the cauliflower to serve with my Indian Curry dish. 9. Spaghetti Sauce – I bet you can figure this one out…It’s for the meatballs! I couldn’t decide which one to use though..The one in the back is a new Vodka Cream sauce that was super low in sugar and carbs. I will have to report back on the consensus. 10. Romaine lettuce – A staple for the fridge. We love Blue Cheese and Caesar dressing topped with bacon, and salad pretty much goes with everything, right? 11. Pickles (Dill) – There are a few brands we like, but these are the kid’s favorite, and they don’t have the artificial yellow food coloring that so many others have that can contribute to hyperactivity in children. 12. Pasture-Raised Eggs – These are in the basket on every trip! We eat a lot of eggs! 13. La Croix – My sister-in-law introduced me to this flavor of sparkling water, and I’m hooked. Sometimes you just need a little zing to your water, and this fits the bill! 14. 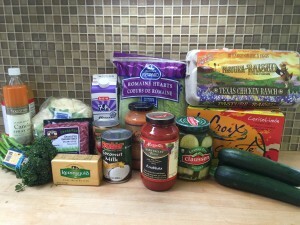 Zucchini – ON SALE at HEB right now! Run and get some! 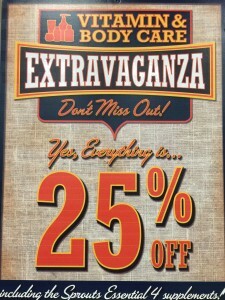 We use so much of this stuff because it is so versatile! I bought two full bags of this yummy and healthy squash. This will be used for the “Spaghetti”. I’m so excited to share it with you later this week! As I use some of these ingredients I will post “after” pictures to show you the end result!